Debian 3.16.0-4-amd64, mysql Ver 15.1 Distrib 10.0.30-MariaDB, for debian-linux-gnu (x86_64) using readline 5.2, 2 VCPU, 4GB RAM, VMware ESXi 5.5.0 build-2068190. On VMWare host, create a VM snapshot. 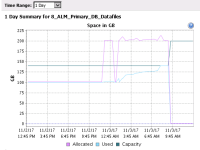 The used space did not change when the snapshot create the files on the datastore. The Zabbix monitoring (attached image) must follow the VMWare monitoring(attached image). ZBX-14548 cannot get refresh rate for Datastore. A specified parameter was not correct.